The last decade has seen many pioneering approaches to social justice organizing that revolve around personal-political transformation. One notable example is domestic worker organizing in the United States. During several Bill of Rights campaigns across the country, coalitions of domestic worker organizations emphasized the transformative power of love and connection and the need to make employers part of the solution. It has been just over eight years since these coalitions won a New York Bill of Rights for Domestic Workers and five since the passage of a similar Bill in California. My own experience with labor abuses among care workers in New York City convinced me that demonizing employers is not the best way forward. The lack of affordable state-provisioned childcare for working parents often forces them into exploitative employment situations with domestic workers. However, our ability to truly transform the broader universe of caring relationships is limited under the current conditions of the global domestic work industry. Exploitation and abuse are inherent in the employer-employee relationship in contexts where cheap and vulnerable migrant labor has come to fill the gaps left by an absence of subsidized childcare services and non-flexible employment conditions for working parents. In order to end the chain of exploitative relationships produced by this situation we need to challenge the conditions that send migrant women to high-income countries for care work and force working parents into undesirable arrangements with their employees. One of the main organizations within the New York Bill of Rights coalition was Domestic Workers United (DWU). DWU was founded in New York in 2000 as a collaboration between three organizers: Ai-jen Poo, Carolyn de Leon and Nahar Alam. Over the course of six years, DWU enlisted a multi-ethnic coalition of organizations in the city to work on the Bill of Rights campaign which included CAAAV (originally the Committee against Anti-Asian Violence), Andolan, Haitian Women for Haitian Refugees, Unity Housecleaners, the Damayan Migrant Workers Association, and (later) Adhikar for Human Rights. The coalition argued that existing labor laws and government protections were vastly out of sync with workers’ realities, and proposed a new Bill to include mandated health insurance, notice of termination, personal days, severance pay, and a minimum wage of up to $16 per hour. These ‘dream’ provisions eventually became the Domestic Workers Bill of Rights. As part of a more effective approach, Poo argued that the campaign would have to humanize care workers and show their interconnections with others, partly through personal storytelling. Poo frequently told her own story of realizing the interconnectedness of all humanity when her grandfather was paralyzed by a stroke and cared for by a home attendant. The same techniques were used in building alliances with employers and formal sector unions, creating sympathy for the cause among prominent media outlets, and convincing legislators to pass the Bill of Rights. During the New York State Senate debate on June 1, 2010, for example, several senators testified about the histories of their own immigrant mothers and grandmothers who had worked as domestic workers. By emphasizing ‘our collective humanity’ the campaign garnered widespread support, but this framing also encouraged a conformity to the dominant myths and tropes that would resonate for a mainstream, white liberal audience. In media interviews, workers were often required to present themselves as isolated, helpless and powerless, and had to excise emotions such as anger for fear of appearing violent. In legal hearings around the Bill, domestic workers were asked to focus on their labor conditions and leave out any analysis of the broader conditions of inequality that structured their work, thereby making it seem as though the problem consisted of ‘bad’ individual employers rather than a system of exploitation. The need to appeal to both Democratic and Republican lawmakers imposed restrictions on the kinds of representations domestic workers could fashion, which worked against the building of a class-based movement that could draw on existing bases of solidarity among workers and challenge the underlying system of economic exploitation. By focusing attention on interpersonal relationships, individual stories and reforming laws to the exclusion of analysing and challenging global structures, the legal advocacy approach failed to address the underlying conditions through which exploitative care relationships are generated and maintained. The final Bill that was signed into law by New York Governor David Paterson on August 31 2010 was watered down from the original proposal and established a very low floor of protections. Some domestic workers who had been involved in the campaign were skeptical of the benefits the whittled-down bill would bring them. 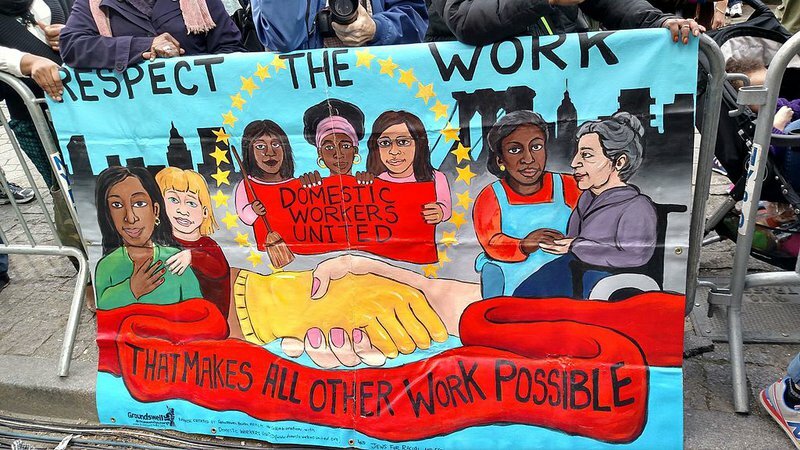 In the aftermath of the campaign, these domestic workers along with other allies came together to restructure DWU as a worker-led organization focused on member outreach, direct action tactics, and community resources rather than large foundation grants. In their daily organizing and storytelling events such as the PEN World Voices Festival, they have sought to engage deeply and critically with the broader structures that perpetuate the care industry. Advocates of transformative organizing aim to solve worker exploitation by improving the wages and conditions of undocumented workers and challenging the draconian immigration policies that make them vulnerable to abusive employers. As a rapidly aging population and a growing need for childcare create a demand for more care workers in the global north, there’s a clear need to fill this gap with workers who are treated with dignity and respect. These are important and worthy goals, but on their own they don’t address the underlying inequalities that drive the global care industry. Even if workers from the global south could receive better wages and work visas to reduce their vulnerability, the fact remains that they are often forced to leave their own homelands and families behind in order to service families in richer countries. This is what we need to challenge, and that means demanding an end to the free trade agreements and other policies that turn the global south into a source of cheap labor. Local sources of work have to be expanded so that labor migration is a choice and not a necessity, and comprehensive, government-funded childcare and elder-care in the global north is required to give people the option of subsidized home or institutional care. In all these areas campaigning is vital, but love is not enough: worker-led and community-funded organizations like the newly reorganized DWU —who are prepared to use adversarial actions to pursue these goals—are essential.